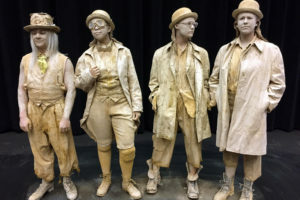 Waiting for Godot by Samuel Beckett is an original, site-responsive production within an immersive ceramic installation. 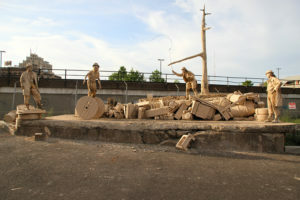 The installation is located outdoors at the Washington Cracker Building art-space on West Pacific Ave. in Spokane, WA.The audience joins the actors inside the sculptural environment for the production. The installation is designed to degrade in response to the weather and is open to the public from June 8 through September 10. 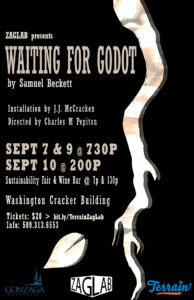 Beckett’s play humorously depicts the futility of action and inaction. Our two weekends of performances in June and September, marking the beginning and end of the installation period, respond to the unpredictable nature of the installation and raise questions about our collective response to climate change. 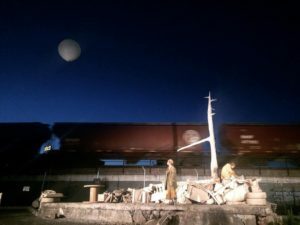 The installation, entitled Elegy, was designed by Kreielsheimer Visiting Artist J.J. McCracken and built with Gonzaga Art Professor Mat Rude. 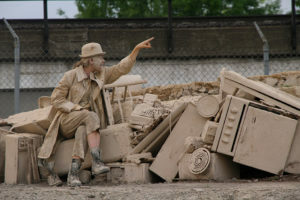 It was composed of clay and found junk contributed by GU’s Art and Theatre & Dance Departments. 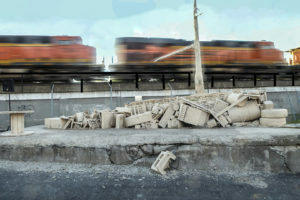 It responded to adjacent elements: the constant flow of materials via the BNSF Railway and the history of the Washington Cracker Building. Embedded objects referred to the transformation of raw material into goods through refinement and manufacture. Items in the junk pile suggested transportation, labor, communication, marketing, demand, consumption and waste when a hill of earthen material slowly weathers, washing over and reclaiming them. The tree, questionable dead, loosely referenced beetle kill ravaging forests as climate change warms the North American forests. Other referents included the Great Pacific Garbage Patch. Click here for more on Elegy by J.J. McCracken.